There’s a lot of money in the world, but not all of it can be easily defined as “money.” Just where the money is and who has it is a complicated issue. The wad of money in your pocket is one form of money, but the money supply is hardly limited to that. So, where is the money and what exactly is it? To find out what Broad Money, Money Zero Maturity, the Monetary Base, and Money and Close Substitutes mean, take a look at the graphic for an explanation. You’ll see that there is a lot more to money than you may have realized. The cash you use from day to day is M0, but there are also MB, M1, M2, M3 and more. If you want to measure how much money a country has, there is much more to consider than just how much printed money is within that country. If you think about how much money you have, it’s likely a lot more than just the cash you have on hand. You have bank accounts, checks and other forms of money that factor into how much money you have. The same is true for countries. How much money a country can get pretty complicated, but there is a way to figure out each country’s quasi money. No, this doesn’t mean fake money or “sort of” money, like the name may imply. Quasi money may also sound like our paychecks these days, but what it refers to is actually a pretty neat assessment of the money that a country really has. 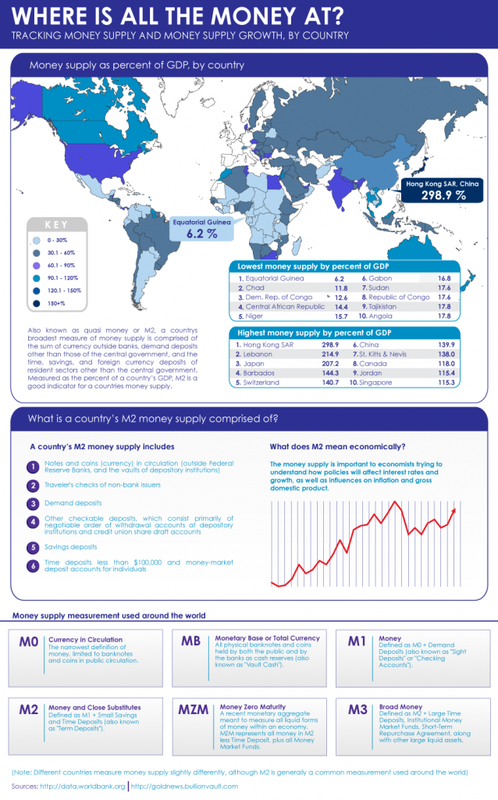 The money supply of every single country can be measured accurately by looking at a number of different things. To find out exactly what goes into the money that a country has, take a look at the graphic. How Does Your Country Stack Up? How does your country compare to other countries in terms of money? The amount of quasi money in each country when measured as a percentage of a country’s Gross Domestic Product (GDP) is pretty telling. Check out the graphic to see how your country rates and whether it makes the top 10, the bottom 10 or falls somewhere in the middle. If you know someone from a country on the top or bottom lists, forward the graphic to them and let them know about it. Depending on where their country falls, it may be time to gloat or to pretend not to be jealous. Where are the top and bottom countries located? Are they countries that are typically thought of as being rich and poor, or do they come straight out of left field for a sneak attack? There are certainly some countries in there that will surprise you as well as some that won’t. Take a look for yourself and see where the wealth of the world lies. An aging population, improving economy and President Barack Obama’s health-care overhaul will push spending on medical services to almost 20 percent of U.S. gross domestic product by 2021, the government just projected. Whether it accurately reflects growth in the United States or not, U.S. GDP gained 0.5 percent during the first quarter of 2016. Barron’s reported investors were not encouraged by the less-than-robust growth rate or by the fact GDP growth in the Eurozone (0.6 percent) exceeded GDP growth in the United States during first quarter. Weak corporate earnings also influenced market performance last week. So far, 62 percent of companies in the Standard & Poor’s 500 Index have reported their results, and the numbers show first quarter earnings have declined by 7.6 percent, year-over-year. That is better than expected, according to FactSet, but nothing to write home about.